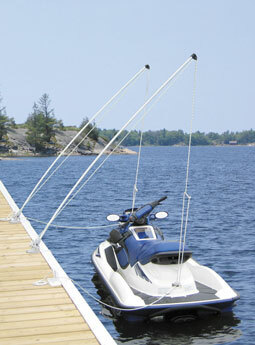 These fiberglass mooring whips are exceptionally strong and act as a spring to maintain your PWC at a safe convenient distance away from your dock to prevent impacts caused by waves or the wakes of other passing watercraft. Each whip mounts with a durable cast aluminum base with built-in cleat. Complete with double braided nylon whip lines, spring lines and stainless steel mounting hardware.